To coincide with Savoy's tour of Norway there was a promotional only one track CD released. The cover is dark red and features faces of the four dolls pictured inside the sleeve of "Lackluster Me". These faces are placed in a `cross shape' with their necks pointing towards the middle. The title in silver letters is in the centre of the sleeve. The reverse is also dark red with the titles in silver down the centre. Beside the text are four small black and white shadowy pictures of the dolls faces. The disc is silver and has quite a rough matt effect to it. 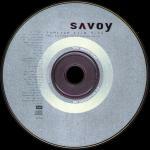 At the top of the disc is the glossy silver Savoy logo and the title in black. Other black text has been printed down the left hand side of the disc. Some copies of this promo were sent out inside the promotional folder, the same folder as that which housed the promo copy of the Lackluster Me album.